How to Sell Products on Amazon Without Your Website? An immense opportunity lies on Amazon to make money and one can make use of this opportunity by becoming a seller at Amazon India website. This is a self sustaining website which does not require any introduction. Listing on Amazon(dot)in is free. In celebration of the launch of Amazon(dot)in which is a new extension of worldwide Amazon(dot)com website and is an exclusive site for India which is the fastest growing market with youngest consumers age group. You can check our listing for Nexus Tab by Google at discounted rate here. Their amazon(dot)in site says that, you can enjoy a promotional referral fee, and free monthly subscription for the first year. Please note that these promotional rates apply if you sign up for a 2 year contract. The promotional referral fee for Books and Movies will be applicable till 5th June 2014. The promotional referral fee for Consumer Electronics, Mobile Phones, All Accessories, Personal Computers, Laptops and Tablets will be applicable till 25th June 2014. The free monthly subscription fee will be applicable till 5th June 2014. All fees are displayed excluding Service Tax. We will apply 12.36% Service Tax (including education and higher education Cess) to all fees displayed above. Referral fee applies to the amount the buyer pays. The amount includes price, applicable shipping fees and all taxes. How to Receive Funds from Amazon for Products Sold? 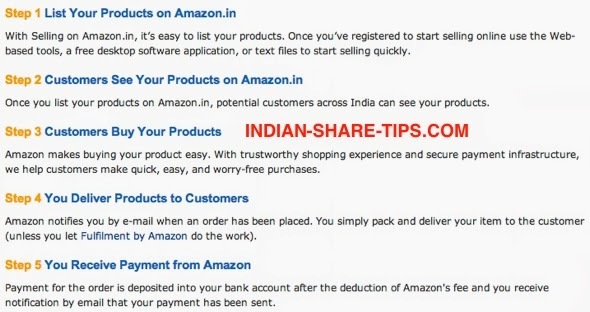 Have a look at below screenshot which will answer all your queries for the way you are going to be paid by Amazon. We feel that all those with even an iota of entrepreneurial skills can use this platform to sell their products as Amazon website is a self sustaining website which will automatically get you traffic for free and you will be able to sell more products without putting in much effort. The best part is that you do not require a website to sell products on Amazon and you have to just concentrate on your core business which is to sell more products.